Milk consumption among children is one of the most strongly pushed ideas in modern pediatrics. Their reasoning for pushing it so hard is that they believe it to be rich in calcium and other nutrients. As we've already covered, the calcium in milk is largely unusable by the human body, so that point needs no further explanation. But the fact that milk drinking is so strongly encouraged by pediatricians as well as schools and teachers remains. One of the surprising aspects of this is that so many parents don't question it. When any product (food, medicine, vitamin, drink, etc.) is pushed so strongly, the motives behind that need to be questioned. 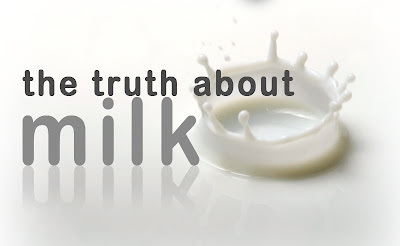 As I said in my introduction post, as much as I would like everyone who reads this to stop drinking cow's milk, above all, I simply want you to ask questions. While there are literally thousands of research studies, each revealing at least one of milk's hazards, the dairy industry goes to great lengths to stifle any damaging rumors. Blanket statements, such as, "There is simply no scientific research to back up these claims," are easily made. With a long and successful history of dairy promotion, these are readily accepted by the public. More people need to go to the real research and learn the truth for themselves. The truth of the matter is that young children are at risk for the same types of problems as adults when it comes to milk. But there are several things that parents of young children should keep in mind. One is calcium. Remember that the calcium in milk is fairly useless and may even lead to a net loss of calcium in the body. Children are still developing and therefore need more calcium than adults. Numerous studies have shown that after adolescence, bone development stops. Why, then, would we feed our young children another species' milk that can be detrimental to bone development? Growing children should be receiving their calcium from other sources, such as green vegetables and nuts. Not from dairy. Another danger to children who consume milk is type 1 diabetes. A number of studies have suggested that early exposure to cow's milk proteins, both in formula and in drinking straight milk after age 1, increases the chances of developing type 1 diabetes. ...infants fed cow's milk formula had a significantly higher immune response to cow insulin than infants who received the other formula or were breast-fed. Finally, a big risk factor for children is that of allergies. Milk allergies are well researched and known to occur in a large number of children. It's often diagnosed as lactose intolerance, but the problem may be deeper than that. Milk contains at least 30 antigenic proteins (those that excite the body's immune system). These immune reactive proteins can cause problems and damage the immune system, allowing further problems to occur. Some studies have even suggested that early exposure to the allergic proteins in milk can lead to other allergies and respiratory problems. A study in the New England Journal of Medicine demonstrated a very clear link between chronic constipation in young children and milk consumption (link to article). The conclusion here is that milk is far from the perfect food for children. In fact, it is one of the worst things to give a growing child.